The first day of summer, the first hint of morning, a loud and scarey buzzing warned me suddenly awake. A thought clouded my distant awareness,”Oh no, what kind of planes are these?” If I opened my eyes, I don’t know. The sky was still dark, yet the sound was so urgent. I worried remotely, unwilling to wake. There was no thought to open the sliding glass door, or look out, investigate the cause of the sound. A tiny finger of lingering consciousness let me cling to a memory as I said a prayer for the world and hoped humanity would survive another day. I turned back toward my inner world and quickly disappeared. Sleeping again, time passed and waited, knowing more light would bring the hummingbirds, and then would be time to get up. The huge noise stayed very loud and strong for over an hour, covering the other morning sounds of birds and wind. As I woke for the second time, exiting the dream of my sister’s birthday on the Summer Soltice, the din quieted noticeably, then completely went away. Suddenly, I realized what happened. Following the shortest night of the year, a fact well known to bee keepers everywhere, bees swarm on the Solstice. I had been listening to a riot of bees who were up at dawn for the longest day. They were busy with much to accomplish today, no time to waste, and urgent focus for the group mind task at hand. sooner what I was hearing. This time I listened but did not see before it was too late. They were gone. I’ve seen it once before, years ago, when I lived in a house where the bees made their home in the south facing wall near a closet. The house had been made with a finger-width gap between the plywood wall board and the beam supporting the roof. It was the perfect size for the door to the hive. They seemed to love the warm side of the house, protected from rain by the overhang, which also gave a bit of shade. Standing outside, you’d always see the bees coming and going, though the door was fairly well hidden. Inside the house, an occasional bee would discover a secret entrance to my side of the wall, through an open screw hole at the light in the closet. The bee would inevitably fly across the room toward the glass window, and eventually I would catch her there with a clear glass cup pressed up to the pane. Then I’d slide a piece of paper or a postcard to cover the top of the glass, then take the captured bee outside to set her free in the garden. Relieved, she’d fly off toward the flowers, and then most likely back to the hive’s other entrance sometime. I was researching what kinds of things one could do to remove a hive from the house, without hurting them if possible. That’s when I learned about the mysterious behavior of bees on Summer Solstice. I did not know at first that they sleep at night, and are mostly quiet after the sun goes down. The workers are all ladies, and the male drones are much fewer in number and larger in size. Many drones are shunned from the hive as winter sets in, perhaps to conserve the food supply, but a few are invited to stay and dance, as this creates extra heat and makes the cold months more cozy. In the spring, a few cells in the nursery are fed with extra special royal jelly, and this breeds the largest bees of all, the young Queens of Spring, next heirs to the hival throne. A retiring beekeeper and mystic once told me that although not all beehives swarm in the summer, if they do, it is usually on the Summer Soltice. Apparently, everywhere in the world on the appointed day, a new queen will fly away from the hive and land on a nearby tree. What I’ve seen when I lived at that house, on the 20th or 21st of June a huge number of bees all flew to a tree in an unusual frenzy in one day. They crawled and clustered all around the tree, making quite a lot of noise, and seeming uncommonly agitated as they flew around. I imagine they danced to keep warm all night, spending the shortest night of the summer on that tree not far from their hive. It was an old dead tree with no leaves where they gathered. What I saw was a shimmering buzzing mosaic of bees coating the trunk of the tree in the upper third of the bark. Countless hundreds or thousands of bees were clinging to the tree, and the longer they stayed the more bees seemed to join them. Then all of a sudden, as if on cue, a cloud of them lifted off and flew in the shape of a spiral fanning behind. The swarm was lost in the nearby woods less than a minute later, off the find a new home for themselves before the end of the longest day. 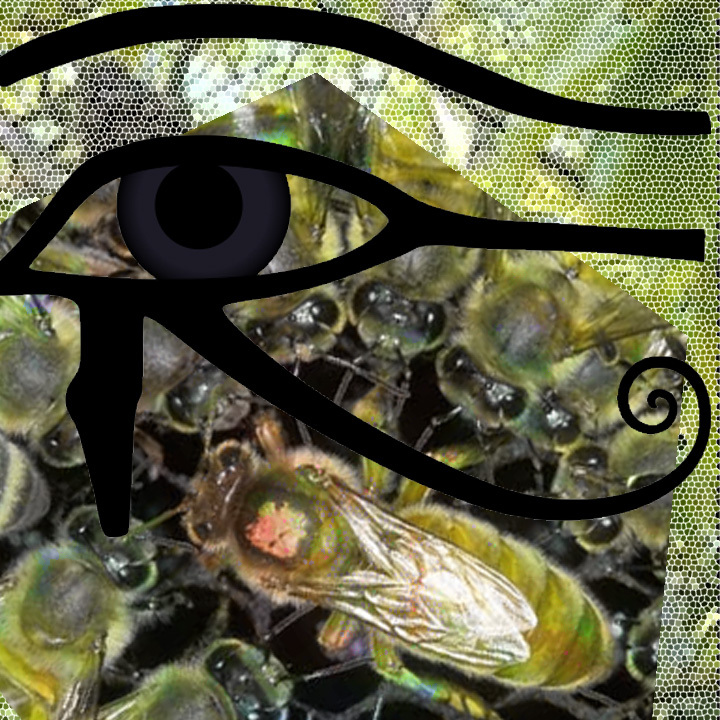 I thought at first they had heard my prayers; Perhaps their diva had come into my dreams and made some bargain on behalf of the hive. I knew we both wanted them all to survive. When things quieted down, however, I learned that only half the hive was gone. Pioneers willing to follow the new queen adventured into the unknown world. Wherever they’ve gone, I hope they found an equally wonderful place to nurture the flowers, and celebrate the Solstice. HERE’s A LINK to a very sweet BEEKEEPER.